All etched with Mermaids holding a waterfall shell having fabulous patina and subtle ware. Verre Églomisé is a French term referring to the process of applying both a design and gilding onto the rear face of glass to produce a mirror finish. The name is derived from the 18th-century French decorator and art-dealer Jean-Baptiste Glomy (1711–1786), who was responsible for its revival. The reverse painting technique produced on these sconces is wonderfully subtle and highly detailed. 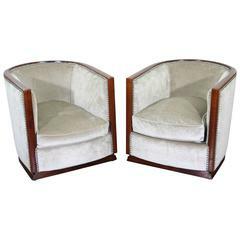 Very comfortable pair of Mahogany armchairs with new velvet upholstery and nickle plate studding. A set of four Danish 1960s rosewood designed by Johannes Andersen. Manufactured by Uldum Møbelfabrik with black leather seats. 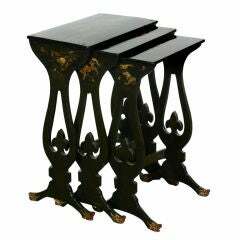 A set of English mid-19th century black lacquer and Chinoiserie decorated nest of three tables. 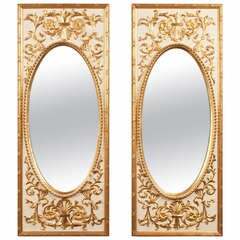 A pair of Napoleon III paint and gilt mid-19th century neoclassical oval mirrors in rectangular frames with foliate and beaded decoration. A set of four French silver plated deco wall sconces, two brackets slightly larger than the other pair, but shades the same size.